Location. 35° 9.997′ N, 84° 52.326′ W. Marker is in Cleveland, Tennessee, in Bradley County. Marker is at the intersection of North Ocoee Street (Tennessee Route 74) and Centenary Avenue NW, on the right when traveling north on North Ocoee Street. Touch for map. Marker is at or near this postal address: 1266 N Ocoee St., Cleveland TN 37311, United States of America. Touch for directions. 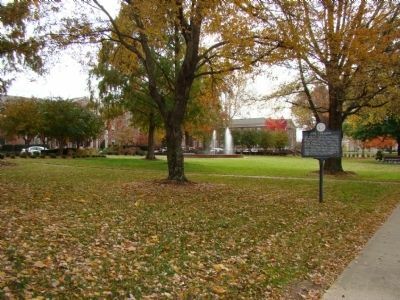 Marker is in front of the college. (approx. 0.6 miles away); Fort Hill Cemetery (approx. one mile away); Cooper Cemetery (approx. 2.1 miles away); "Chief Jack" Walker (approx. 2.7 miles away); Charleston on the Hiwassee (approx. 10.3 miles away); The Henegar House (approx. 10.6 miles away). Touch for a list and map of all markers in Cleveland. More. 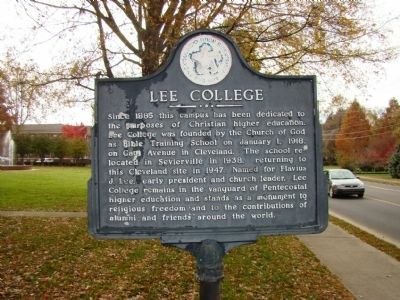 Search the internet for Lee College. Credits. This page was last revised on June 16, 2016. This page originally submitted on November 16, 2011, by Judith Barber of Marietta, Georgia. This page has been viewed 556 times since then and 6 times this year. Photos: 1, 2. submitted on November 16, 2011, by Judith Barber of Marietta, Georgia. • Bernard Fisher was the editor who published this page.